Compatible withK 2, K 2 Compact, K 2 Premium, K 2.14, K 2.14 WB, K 2.15, K 2.100, K 2.120, K 2.125, K 2.130, K 2.140, K 2.150, K 2.300, K 2.310, K 2.311, K 2.325, K 2.330, K 2.335, K 2.395, K 2.400. Inlet M22m Outlet Karcher K-Series. 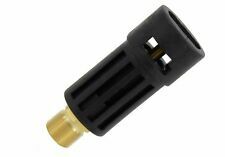 Karcher K-Series Compatible Female Adaptor. A Heavy duty adaptor designed to convert old style m22 karcher. Nilfisk machines such as Compact 105-110-120-125-135. A Heavy duty plastic adaptor Converts Compact Quick Release into Nilfisk compatible. KARCHER PUMP SEALS. 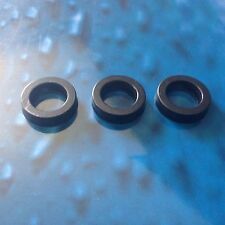 3 X 14MM HIGH PRESSURE SEALS. WILL FIT THE ABOVE AND MANY MORE. 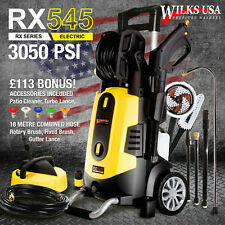 The Voche 1400w 105bar Portable Jet Power High Pressure Washer 102580VH is ideal for anything from cleaning your car, to cleaning your patio, to removing dirt and paint from ironwork as preparation for re-painting. TheWater Jet Power Washer high pressure water wand hose nozzle is a must have item for all outdoor cleaning needs.This specially designed wand is designed to turn any standard garden hose into an ultimate power washer. RYOBI RPW150HS HOSE 5131019310 SPARE PART Type 1. Ryobi RPW150HS HOSE 5131019310 Spare Part. This hose is for a Type 1 Machine the Type 2 Machine has a different Hose. LARGER PUMP VALVE TO FIT OLDER KARCHER HDS MACHINES. VALVE FOR THE OLDER KARCHER HDS MACHINES. KARCHER HD & HDS STAINLESS STEEL PUMP VALVE. THE BUY IT NOW IS FOR 1 X VALVE. 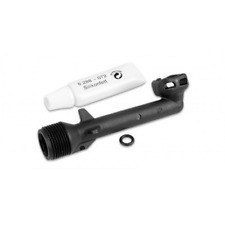 Karcher K2-K7 Adaptor to 11.6mm Compact Quick Release complete with quick release nozzles. 4762506, 4.762.506, 47625060, 4.762-506.0 2644031 2.644-031.0. KARCHER Adapter To Convert Old Style Hose To New Style Quick Release Hose Order no. 2.644-031.0. All our products sold areGenuine Karcher. 2 x 20mm high pressure seals to fit the older style 2 piston Karcher pressure washers. T his kit saves buying a full 20mm kit if your machine only uses 2 x 20mm high pressure seals. Flat spray with a simple twist of the nozzle head. Adjustable Angle Spray Nozzle/ Multi –Reg. 1/4"F inlet fits most industry standard lances, Includes pressure nozzle. Adjust the spray pattern from 0° solid stream to 80°. Stainless Steel body glycerine filled pressure gauge. 0 - 250 Bar. 1/4"M Rear inlet. Thread Size: M22 x 1.5 male. 1 x Heavy Duty High Pressure Jet Wash Adapter. Thread Size: 1/4 female. Fitting Material: Brass. Fitting Angle: Straight. Part Number: 59434. 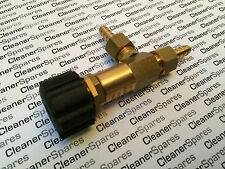 Genuine Karcher K-Series hose adaptor M22F to K-series quick release. to connect the push fit Karcher K Series hose. This socket will screw onto a M22 outlet on any K Series pressure washer without a reel and allow you. It will fit the Hobby range of machines. (Not suitable for industrial machines) such as the Hobby 01K, Hobby 88, Hobby 80, Hobby 100, Hobby 120, Hobby Classic, Hobby 3600 Xtra many others. An easy DIY repair to get your KEW Hobby back up and running. Nilfisk machines such as Compact 105-110-120-125-135. The brass connector is designed to fit Latest Nilfisk Models, Titan, exta and many more. K archer K-series Female a daptor bayonet fitting. M22F Inlet 19.5mm Quick Release probe. Not compatible with the new easyforce connections used on 2017 Karcher models. A heavy duty high pressure quick release coupling plated steel finish. Inlet M22M Outlet Karcher K-Series. 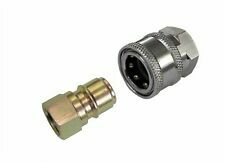 Karcher K-Series Compatible Female & Male Adaptors. A Heavy duty pair of adaptor designed to convert old style m22 karcher. Easy to use quick release system. Gun & solid lance assembly is designed to fit a wide range of pressure washers including Karcher & Nilfisk machines. Complete With Snow Foam Lance and wash nozzle. Lance Length: 500mm. • Fully Detachable 700mm Lance With Compact Quick Release Compatible Adaptor •. • Stainless Steel Rotary Arms & Wash Nozzles•. • Compact Quick Release 11.6 mm Connection •. 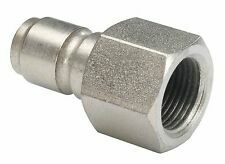 Washer end connection M22 / 1.5 Female Screw thread. Lance end connection M14 / 1.5 Female Screw thread. 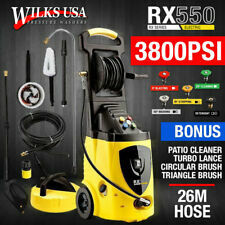 Compatible with most pressure washers and lances with screw thread connections. High quality kink-resistant hose produced from Dacron?. 2643214, 2.643.214, 26432140. KARCHER Surface Cleaner T-Racer T 450 K4 - K7 NEW order no. 2.643-214.0. All our products sold areGenuine Karcher. K4, K5, K6, K7. Karcher Center Aquaspray. When you’re cleaning large areas outside, two factors are likely to be on your mind – the finish you get and how long it takes. VERY INDUSTRIAL AS WE ADAPT THIS KIND ON ALL OUR 240 VOLT MACHINES. This will let you connect older standard 22mm hoses to your easy force Machine either at the gun or the outlet of your machine. Female Karcher K-series Adaptor to Lavor/Lavorwash Compatible. switching pressure washers. 9085013, 9.085-013, 90850130. KARCHER Motor Run Capacitor 25 MF Order no. 9.085-013.0. All our products sold areGenuine Karcher. Karcher Center Aquaspray. This capacitor is 25 uF. N.B. your Spare Part may have stamped on it Xun Da, CBB60, 500VAC D 50/60 Hz, 40/85/21 SH PO. A heavy duty high pressure quick release. Not Compatible with the Easy force connection used on new Karcher 2017 Models. Coverts your M22 lance into quick release. SIMPLY REMOVE THE LANCE SOCKET & SLIDE FIRST PART OVER LANCE END. 3 X INDUSTRIAL 2 PART PRESSURE WASHER LANCE JET PROTECTOR VERY RIGID PLASTIC. SCREW ON NOZZLE SOCKET THEN ADD SECOND PART. A pair of heavy duty high pressure quick release couplings. Thread size: 3/8" F B.S.P. THE ITEM YOU ARE LOOKING AT IS A SUTTNER ST261 UNLOADER PRESSURE SWITCH. HOW TO SETUP PRESSURE SUTTNER ST261 UNLOADER VALVE & PUMP SYSTEM QWASHERS YOUTUBE WHY - YouTube. A GREAT INDUSTRIAL PRESSURE REGULATOR VALVE FOR INDUSTRIAL MARKET. THIS IS A KARCHER COMPATIBLE 22MM FEMALE X 1/4 BSP FEMALE COUPLING ADAPTER TO MAKE YOUR HOSE INTO A 22MM FEMALE. WILL FIT MOST OLD TYPE KARCHER MACHINES &NOT THE NEW EASYLOCK THREAD SYSTEM. 22MM X 3/8 BSP FEMALE. Quick Release Size: 11.6mm male. Thread Size: 1/4 male. 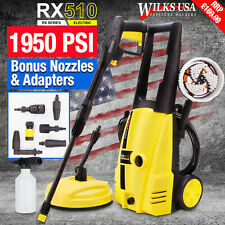 1 x Heavy Duty High Pressure Jet Wash Adapter. Fitting Material: Brass. Fitting Angle: Straight. Part Number: 59251. Demon MotorSport. Nito Double Hose Tail High Pressure Water coupling 1/2" & 3/4"